The guidebook Oregon Breweries is mere weeks old but the nature of the Oregon brewing scene is so fluid in nature, there are already a few brewing companies serving us that aren’t fully introduced in the book as well as one that is no more. In full candor, I have a mental list of a very small handful of breweries that I feel are not long for this world. In rare instances, it’s because the beer’s just not worth selling. In most instances, I just don’t see them being able to get their product into a sustainable number of thirsty mouths. Heck, maybe in such a Venn diagram there’s a large intersection. 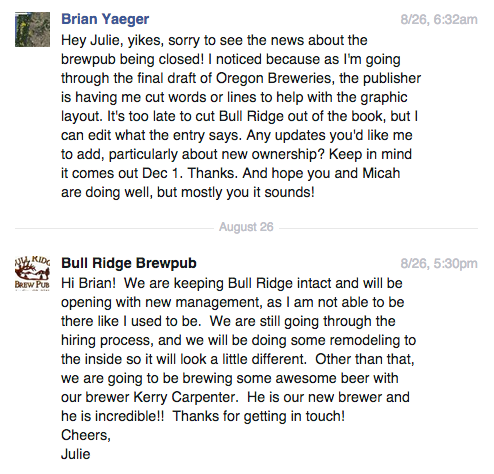 In any event, I had Baker City’s Bull Ridge pegged for the brewery obituary section and lo and behold, they’ve perished. Rip page 197 out of Oregon Breweries. No, don’t! Double Mountain is on page 198 and they’re never going anywhere! As seen in the screen shot above, I’d even contacted this brazen brewpub that bid to build Baker City into a two-brewery town alongside Barley Brown’s. Scroll through the comments on this thread this yarn and you’ll see there’s little love lost in town. The owners were inexperienced both in the restaurant game and the brewing biz. Two things pretty vital for operating a successful brewpub even here in Portland let alone a town of fewer than 10,000 people with tourism seasons that are more shoulder than peak. On the upside, Barley Brown’s runs both the pub and the “Baker City Brewing” tasting room across the street, so Baker City’s still, technically, a two brewery town. This entry was posted in 2nd Edition, Oregon and tagged Baker City, Barley Brown's, Bull Ridge, Double Mountain, Eastern Oregon by Brian. Bookmark the permalink.